As I journey through the Psalms, I truly enjoy reading and being a part of them. There is such peace, rest, and quite a bit of edification in allowing the Word to speak to your heart. I find that when I place myself in the writer’s position I almost become part of it. For instance, Psalm 116 speaks of God’s love and deliverance. For me, this hits home—for I was delivered from alcohol and tobacco—God’s miraculous hand upon my life, changed me from the inside out. I never imagined that I would be doing today, what I am—it’s a literal dream, as my heart and soul teem with overflowing joy. I can see exactly why the Psalmist begins the Psalm the way he does. There is no greater feeling than waking up or lying in bed for sleep with an enormous burst of love in my heart for the Creator. However, it was not always this way. For this reason, I praise the Lord of heaven, earth, and creation, for He loved me and heard my cries. Let me ask, where are you with God? Do you think He is distant? God is not the one who is distant, we choose to walk in our desires and flee His love (Eph 2:2; James 1:14). If you’re struggling with a stronghold, addiction, or sin vice, my prayer is that you dive into your heart and take a good look at your life. Reflection can be good for the soul. Psalm 116: 2-4 , “Because He inclined his ear to me, therefore I will call on him as long as I live. The snares of death encompassed me; the pangs of Sheol laid hold on me; I suffered distress and anguish. Then I called on the name of the LORD: “O LORD, I pray, deliver my soul!” (v2-4). God is not required to hear, listen, or acknowledge us—but we are getting a glimpse into the infinite and unconditional love of our Creator. A picture is painted of a loving Father, bending over to listen to His child—One who is never tired of hearing the cries for help. Psalm 116: 5-7, “Gracious is the LORD, and righteous; our God is merciful. The LORD preserves the simple; when I was brought low, he saved me. Return, O my soul, to your rest; for the LORD has dealt bountifully with you” (vv. 5-7). Grace. How does one describe a word which utters unmerited favor—that while in my rebellion and sin a loving God would dare to look upon me? Do you know that is exactly what Christ has done? For He loved us ALL, while we were at enmity (enemies) with God. While we were walking in our passions and desires, He came and preached the good news of the Gospel (Eph.2:17), and destroyed the wall of hostility (Eph. 2:16), becoming our peace (Eph. 2:14). Did you also know that nothing can separate you from the love of Christ (Rom. 8:36-39); keep running—His love is stronger and faster and more patient. What brings joy to my heart is seeing the words “Return, O my soul, to your rest.” For until Christ came and rescued my soul, I did not know rest. Back then, rest was a day off filled with activities to try and quiet my mind (i.e. television, sports, yard work, shopping, etc. ), but only Jesus could bring me peace. This is His reconciling power—through the Cross (Eph.2:16). To reconcile something means to bring it back into harmony—that is what God has done through Christ. We have sinned and fallen away; BUT GOD, has brought us back into harmony, as we were originally created. The weeping tears of repentance are pure before God—they cleanse the soul. The Psalmist empties his heart before the Lord and in return he is reassured that God will direct and watch over his steps—this is trust. The Psalmist notes that there is something he must do; likewise, when I called out to God, I did not return from where He once delivered me, I changed my ways. I was determined to walk among the godly. It is noble to reach the lost and a requirement, but there is wisdom in walking “before the LORD in the land of the living.” Finding people who will encourage you and walk with you is imperative—they are among “the living;” people regenerated and reborn by the Spirit. How vital it is to believe—by faith, the Psalmist relays that he understood that his soul was afflicted. The Hebrew connotes that he “believed indeed,” a confirmation to the mind. I would say it is not healthy to live in the past, but don’t forget where you came from. The pit that God delivered you from; remember, and believe! Are there truly any works in which we can repay God? No, but there is obedience. It’s important to walk the way you pray. For instance, if you pray and ask God to help you, don’t return to the old lifestyle thinking He is going to honor that or force you to follow Him. Remember your vow. I know that when I pray and ask God to help me with something, I remember the next day that I asked for help in that area and turn from the desire, fleeing evil. This is where integrity comes in, as Thomas Paine stated, “Reputation is what men and women think of us; character is what God and angels know of us.” Whatever you do in private is what is public before God—pay your vow—you surrendered to Him. 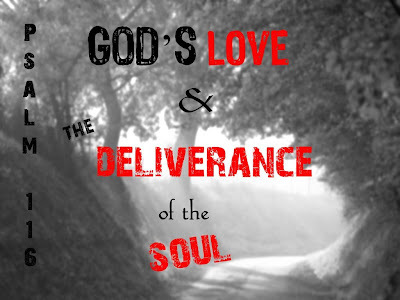 God’s love and deliverance are both illustrated in this verse. The irony of being a “free-servant” is not irony at all, but reality. God has loosed and lifted the bonds to the slavery of sin and adopted you (Eph.1.5). However, you are still a servant, yet one who is free. “Precious in God’s eyes; not only in life, but also, and especially, in death, is the soul of God’s people delivered. We are ever before Him. Not a sparrow falls to the ground without His omniscient knowledge” (Matt.10:29); how much more are you worth to Him? Don’t fear the current situation—God is in control, full and complete control. Satan is not God, he is not omniscient, and he is not a creator, only a duplicator. You are sealed with the Holy Spirit with a sign that says to the rulers and authorities of the universe, “MINE, do not touch!” (Eph. 1:13). What an ending! I would be doing a disservice if I did not publish the last three words—a doxology of praise! God, the deliverer of our souls and the One who loves us without conditions, works, or need for appeasement; He is worthy to be praised!